Jeff has gone on to be known around the world for the quality and comfort that his professional tools of theatrical transformation offer maskers of every sort, from Opera, Theatre, Dance, Magic, Music, and serious fun makers to collectors. In 2016 his first masks on Broadway appeared in Lincoln Center's "Falsettos." And you too can support this loony career by acquiring a mask of your own, or taking classes from the Mad Master. Very few mask makers teach and none as free of nonsense and dogma as silly/serious Jeff Semmerling. ​Find your alter-ego within our "MASK SHOP" & gallery of the finest, most comfortable handmade masks, ANYWHERE! 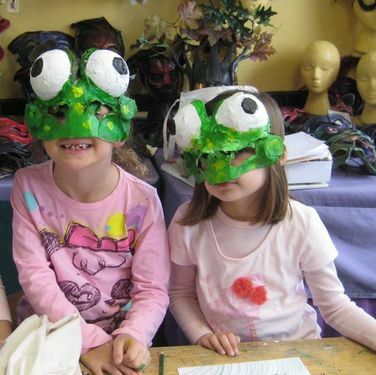 ​Art Parties, Camps and Classes for kids and kids-at-heart in our fabulous studio! Learn how to make leather masks and crafting in papier mache', cardboard for masks and giants from Chicago's Master Mask Maker!